Are Your Child's Worries Making Them Sick? 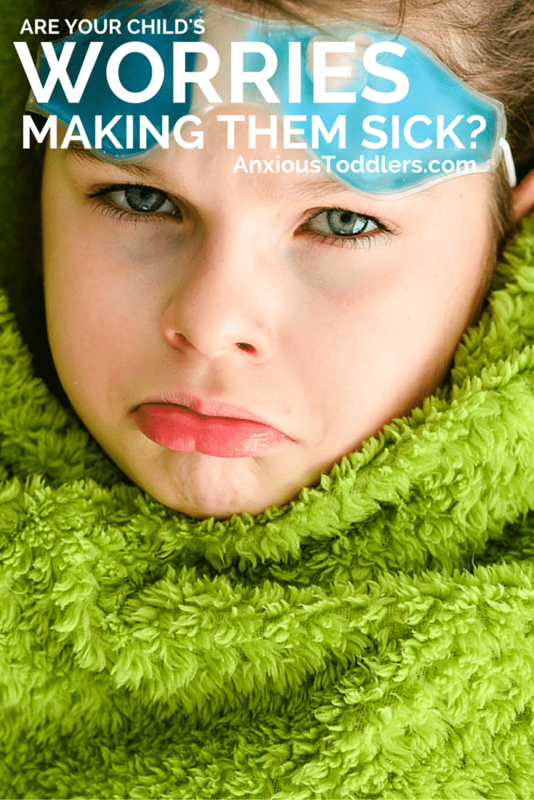 Are Your Child’s Worries Making Them Sick?
? And that’s not all – add headaches, stomach aches, nausea, difficulty swallowing, sleep disturbance and constant urination to the list. is stronger than many of us think. Your child’s worries aren’t just causing your child stress – it can be physically harming them. this article is for informational purposes and should not replace the guidance of a qualified medical professional. It is always important to go to your doctor to rule out any and all medical origins when your child is exhibiting these physical symptoms. When our child’s worries take over – their body goes into overdrive. Their mind might understand that they are not in immediate danger, but their body does not. This biological response revs up their fight or flight response – arming your child for battle. A battle they are not fighting. A battle that will wear them down and create physical distress. These physical symptoms are real. The pain is real. Your child has no control over these physical symptoms – and cannot just make them stop. When you address your child’s worries – eventually the physical symptoms will dissipate. When your child is worried their body releases adrenalin. Hormones interact with their gut letting their stomach know that they are in distress. Their body tenses and abdominal muscles tighten. All of this leads to a very uncomfortable stomach – to say the least. There is also new research pointing to the gut – as the cause of anxiety. For an interesting read on that topic check out the article Anxiety, Depression and the Surprising Role of Gut Bacteria over at Hey Sigmund.
. Unfortunately pooping just isn’t high on the body’s priority list. When many of us are stressed we are more prone to getting a headache. Children are no different. As we talked about earlier, worries cause your child to tense up. They can tense up everywhere – including the muscles around their neck, eyes and head. This can cause a feeling of pressure or sharp, sudden pains. To learn more about the different types of headaches anxiety can cause click here. because they have less distraction. Safety worries – including health fears and bad guys tend to rear their ugly head at bedtime. – breathing can get shallow and it can be hard for them to get a deep breath. Unfortunately this perpetuates their panic and they start to fear there is something medically wrong with them. When your child’s false alarm is going off in their body – internal havoc is playing out. Their heart is racing and they are having a hard time getting a deep breath – this can lead to sudden feelings of dizziness. Which again – perpetuates the worry that something is medically wrong with them. When our body is preparing for battle – one of the first reactions is an increased heart rate. When faced with worries, adrenalin is released causing the heart to race. Some kids will hyperventilate when stressed – causing an imbalance of carbon monoxide and oxygen in the blood stream. When this happens their heart has to work harder to get blood throughout the body. Unfortunately feeling your heart race can be anxiety-producing in and of itself. Chest pain is a common symptom that accompanies anxiety. When people hyperventilate – this can cause their chest to hurt. Often when kids are having a panic attack they will have tightness around the chest and may believe they are having a heart attack. If a child has worries – they are more likely to constantly clear their throat. That might seem bizarre, but anxiety causes extra mucus. Mucus that likes to sit at the back of the throat. Not fun. You can read more about this issue over at Calm Clinic. Along with the need to clear their throat, some children feel like they can’t swallow – or worse that they are choking. In the most severe cases, children will stop eating due to this fear. For more information on this phenomena click here. The need to urinate constantly can be blamed – yet again – on that fight or flight response. When a body thinks it is in danger – it wants to get rid of any and all bodily fluids so it is not slowed down. Unfortunately this creates the constant sensation that one needs to pee. Some anxious children also have sensory issues which further heightened their awareness to bodily sensations. Children with a predisposition to anxiety – are also more at risk for compulsive behaviors including picking behavior. Children with this issue feel a constant urge to pick their scabs. This can become an issue when children do not let their scabs heal and they get infected. behavior can be a comorbid condition to anxiety. Trichotillomania is the constant urge to pull one’s hair, eyelashes or eyebrows out. The urge is strong and children may need professional help to learn how to manage this issue. Often children who worry bite their inner cheek. Parents may not notice this behavior until their dentist points it out. This becomes a concern when children are breaking the skin – leaving open sores in their mouth. Some children who worry tend to frequently lick their lips. Some children will then wipe their mouth with the back of their hand repeatedly. This can cause a red ring to appear on the upper and/or bottom of the lip. The lips will have a red, chapped look to them. Having a child who worries too much can be a challenge. Add these physical symptoms to the picture and it can be overwhelming. As discussed at the beginning of this article – go to your doctor and get a complete medical evaluation. If your doctor determines the issue is caused or exacerbated by worries – treating the worries can help alleviate these physical symptoms. For a great website on how to help physical symptoms of anxiety – visit Calmclinic.com. Do you have friends or family that have children with these physical symptoms? Pass the information along. The sooner kids can get help – the better! Does your child have physical symptoms when they worry? Share your story below so others can learn the effects of worries on the body. Natasha Daniels is also the author of How to Parent Your Anxious Toddler. She offers a video course on How to Parent Your Anxious Kids – for all ages. If you liked this article, don’t keep it to yourself! Use the share buttons on the left and share with others.